Friday tip: Support your local libraries. It’s good for you and our future depends on it. This entry was posted in Uncategorized on March 31, 2017 by kellykoepke. Take that electronic readers! Paper books are on the upswing. This entry was posted in books on March 30, 2017 by kellykoepke. Alive with pleasure, to steal a slogan from the tobacco industry. This entry was posted in books on March 29, 2017 by kellykoepke. This entry was posted in Web Copy on March 28, 2017 by kellykoepke. When you work with me, you can create happiness. Let’s talk about how I can make you happy. I’ve got room for a few more clients at my Premier and Elite levels, so if you could use a marketing and communication boost in your business, let’s talk. This entry was posted in Uncategorized on March 27, 2017 by kellykoepke. Friday tip: In business, as in life, you get what you pay for. Use this infographic to help you set up a social media marketing budget. This entry was posted in Friday tip, Social Media Marketing on March 24, 2017 by kellykoepke. A chuckle for your Wednesday. 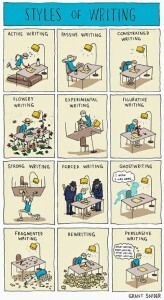 Yes, there are indeed many writing styles. This entry was posted in Grammar on March 22, 2017 by kellykoepke. Are you signed up for my free, monthly email newsletter? Great info on better communication. And did I mention it’s free? This entry was posted in Newsletters on March 21, 2017 by kellykoepke. This entry was posted in Uncategorized on March 20, 2017 by kellykoepke.